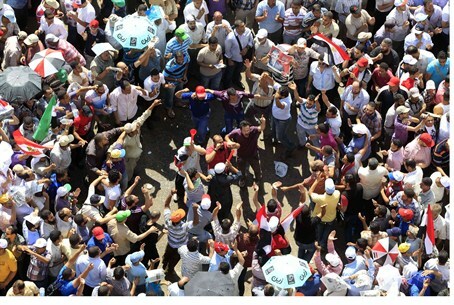 Egypt has chosen the Muslim Brotherhood to lead the country after former President Hosni Mubarak. The electoral commission made the announcement after delaying the news for more than four days and several recounts. Tens of thousands of people burst into cheers at hearing the news. Muslim Brotherhood candidate Mohamed Mursi, now President-elect, had already announced his victory – but so had former Prime Minister Ahmed Shafiq. Shafiq, who represented the old regime and who once was head of the Mubarak-era Egyptian Air Force as well, angered the crowds of Muslim Brotherhood demonstrators who camped out in Cairo's Tahrir Square, waiting for news. Mursi, an Islamist U.S.-educated engineer who once languished in prison upon the orders of Mubarak officials, won with 51.7 percent of the vote, the commission said, in the presidential run-off election that followed the general vote. He is the first to succeed Mubarak after the January 25, 2011 revolution that ousted the 32-year president who maintained an iron grip on the Egyptian nation.